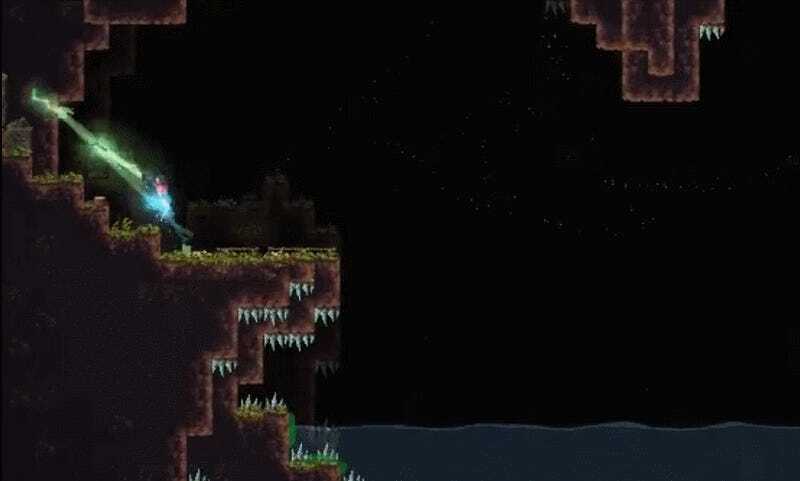 Remnants of Naezith is a platformer that stars a grappling hook and wants to be the Super Meat Boy of twitch-based ledge swinging. There are dragon souls and remnants of them (as the title suggests), but in the end it’s all about being a futuristic Tarzan in a low-res world. “I loved playing Spider-Man 2 on Playstation 2,”the game’s creator, Tolga Ay, said in an email. “Swinging and roaming in New York was just awesome.” The game was great and reminded everyone that licensed superhero games didn’t have to be junk because it simply stuck the beloved web-slinger inside a bare bones rip-off of Grand Theft Auto. Remnants of Naezith is intended to be similarly unencumbered, with little in the way of monsters or item pick-ups (although there are portals). It’s no Flinthook, in other words, trading roguelike dungeon crawling elements for breezy, satisfying feel of ceaseless swinging. “It’s pure grappling hook, dash and double-jump action,” he said. “The main principle is that there is no limit on the speed so the only limit is your skills to accelerate and keep your momentum.” Inspired by games with similar principles like Super Meat Boy and Dustforce, Ay looked to build those single-player experiences out into something more competitive by way of leaderboards, mastery ghosts, and in-game speedrunning modes. 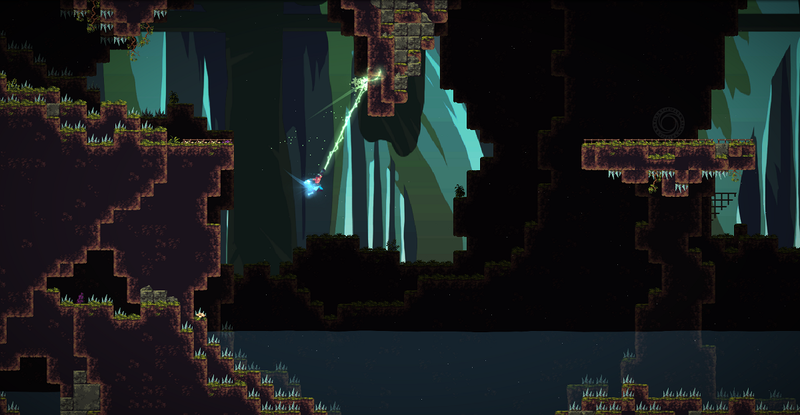 While grappling hooks aren’t by any means alien to video games, Remnants of Naezith is somewhat unique in how it urges the player to embrace it unabashedly. Rather than use it simply as a puzzle mechanic as in The Legend of Zelda: Ocarina of Time or Arkham Asylum, or position it as some special ability to be limited for fear of breaking the game, it elevates the grappling hook to centrality of something like jumping to the Mario series; a way of moving and being in the game’s world to be celebrated rather than managed. In Remnants of Naezith, as in Worms Armageddon, swinging is meant to be more than just a whimsical form of transportation: it’s meant to be its own form of art. Remnants of Naezith being shown at the Quo Vadis game convention in Berlin. For the new player, Remnants of Naezith might take ten hours to complete, if they complete it at all, but for runners who have already been practicing the game, the best times are closer to 20 minutes. Ay knows this based on the leaderboard from the game’s closed beta. After starting work on it three years ago in his parents house in Istanbul, a community of like-minded players interested in the game’s speedrunning potential sprouted up around it. As a result, Remnants of Naezith got greenlit the day it went up on Steam and got help from Jon Bailey of Honest Trailers, who provided voice work, and Ömer Tunç, who helped with some of the art. Now, with the game set to release late this year, Ay hopes to the competitive atmosphere around the game will encourage speedrunners to champion it for inclusion at next year’s Awesome Games Done Quick marathon and show the rest of the gaming world why it’s time grappling hooks got more love.